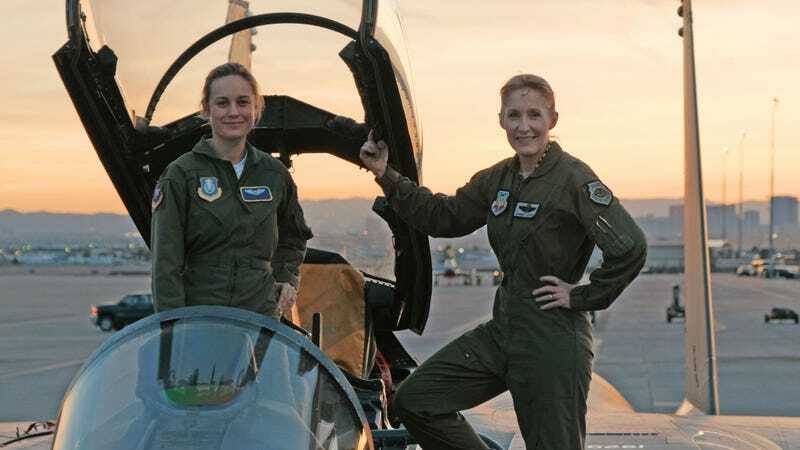 Brie Larson, star of Captain Marvel, does some research with Brigadier General Jeannie Leavitt, 57th Wing Commander at Nellis Air Force Base in Nevada. Disney just announced that Captain Marvel is officially in production and the cast list contains some very intriguing and surprising names. They are Djimon Hounsou, Lee Pace, and Clark Gregg, all of whom have appeared in the Marvel Cinematic Universe before. Since Captain Marvel is set in the ‘90s, features the Skrulls, and will have some kind of S.H.I.E.L.D. connection (Samuel L. Jackson is also back), it seems likely Hounsou and Pace could be reprising their Guardians of the Galaxy roles as Korath and Ronan, and Gregg could be back in action as Agent Coulson, of Avengers and Agents of S.H.I.E.L.D. fame. So does the fact Ronan is in this hint we’re going to see the Kree-Skrull war? How does S.H.I.E.L.D. react when they become aware of Captain Marvel? Is Hayley Atwell’s Agent Carter not a part of this? (Please let her be a part of this!) Will the Avengers ever learn Coulson is still alive in current times? And when will audiences see how Captain Marvel meets back up with the events of the modern MCU? There are so many questions and we eagerly anticipate the answers. Directed by Anna Boden and Ryan Fleck, Captain Marvel also stars Brie Larson, Ben Mendelsohn, Lashana Lynch, Gemma Chan, and Jude Law. It opens March 8, 2019.